This application randomizes the order of clips in Apple's Final Cut Pro X, to provide inspiration for montages. 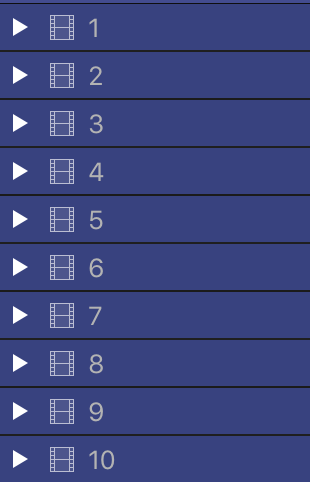 Drag clips or a project straight from FCP X to Random-X to get a brand-new project with the same shots in a new, random and shuffled order. Or export an XML from FCP X and load it into Random-X. The intended workflow is to use Random-X many times over while working on a montage. This helps you exploring your footage and evaluating its strengths and weaknesses quickly - simply by presenting your shots in a new random order each time you have the project randomized. While you shouldn't expect the application to create a montage all on its own, Random-X can help you a lot in the rough and early stages of putting together your montage. Clips can be used whole and complete, or just the favorite or keyworded sections. Adjacent clips in projects can be kept together with strategically placed Markers. At it's heart Random-X reads XML from FCP X, shuffles the shots in the XML, and a modified XML goes back to FCP X. The result of shuffling shots in Random-X always is a new project, with a name that has the current date and time appended. In FCP X the new project will always appear in an event called "Random-X". For projects Random-X shuffles the items on the main storyline only. Everything that is attached or nested to items on the main storyline remains attached and nested in the very same way it had been before. Transitions will be discarded during randomization. ... to this in seconds! Random-X runs on Mac OS 10.12 and later, and understands XML from FCP X 10.3 and later. Random-X is available on Apple's Mac App Store.